Eric I don't think you should ever worry about showing us any gorgeous shot of Paris! Classic or not. This is definitely gorgeous, timeless. I'm agree with Louise. This is a beautiful photo! And don't hesitate, this kind of photos makes me want to research about it. Today, you help me to know about Descatoire and find out that La Jeunesse, is one of the eight gilded figures on the Palais de Chaillot. Thanks a lot! Oh how I miss her so. Really great shot. Great sky. La Jeunesse watches, Tour Montparnasse hides. No one has done this shot before! The clouds make it surreal. On first take, I didn't think it looked like a photo at all. It is really lovely Eric. Yes, yes, and I learned about Douai, where Descatoire came from. I'm trying to recall: has Eric ever posted anything when we all said, "Ooh, thumbs down, too conventional, too 'Paris'!" Surely you must know that any view of the ET will be embraced by your friends and fans, especially one as special as this—vraiment, great shot, Eric! you know what...it is my dream to take a shot of the eiffel tower. very lovely. i luv it. This looks like a tinted etching. I especially like the pigeon striking the same pose behind La Jeuness. The clouds are amazing. Like pillows. And the drabness of the city except for the Lady. It is all very natural. I love how the pigeon posed - he knew it would be a fabulous shot! thanks for the intro to the lady, i have never seen her before! The Eiffel Tower is so present everywhere you go that it's easy to forget how special it is. You see it on postcards at kiosks in the street, on umbrellas, tablecloths and of course live. 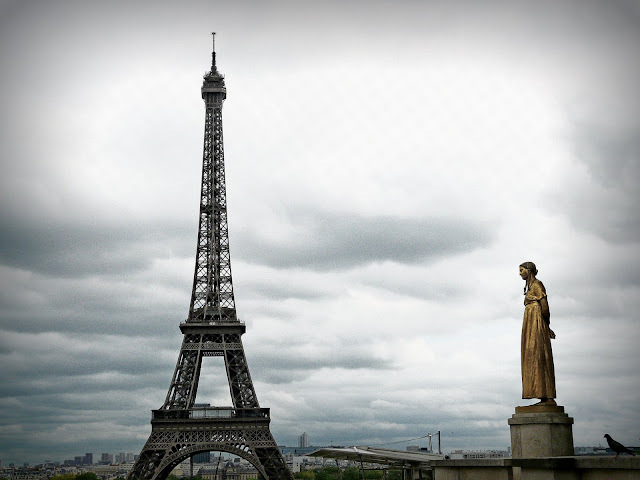 What I love about this photo is to learn something more about the statues surrounding the view from the Trocadero, which are almost always forgotten by tour guides and Parisians alike. Thanks Eric. I won't be aiming at you, Michael! I'd feel exactly the same if I were deluged daily with images, lots of them not very good, of things I see every day. (From afar, though, I still can't get enough of the "classics".) This pic is so unique and beautiful - the mood and colors both remind me of a Jeunet film. Melancholy. Foreboding. Mysterious. A place where statues may come to life at any minute. I know what you mean, Michael. I see the Golden Gate so much that I barely notice it anymore. When I lived in New England as a child all that settling the 13 colonies stuff was just so blah blah blah whatever. It fascinates me now that I'm away from it all! ETSuzy -- I've totally had the same trajectory with all the '13 colonies stuff'. Never in a million years did I think I'd ever want to see any more of it, but, after 10 years or so away, I seek it out! Absence makes the heart grow fonder, I guess! I never get sick of the Eiffel Tower! Just to say the I LOVE the Classic Views of Paris!!!! Thanks so much!! I think when you get used to a view or the history of the place you're in, it is time for a revisit for a fresh perspective. Look at the Eiffel Tower today for those of us who have never seen it in person and marvel. I love this - I like classic images, so my vote is to sprinkle them in. :-) Makes people happy. Amazing as always! I simply love her!